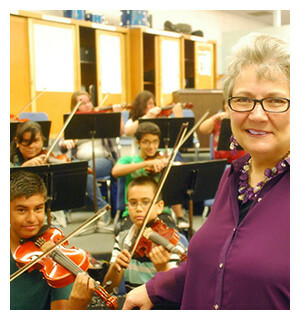 At Yuma School District #1, we recognize the importance of the arts in education. Every school has at least one certified, endorsed art specialist, and the curriculum matches the Arizona State Standards. We provide students with experiences that include guest artists in residence, art history, critical art, special art events, literacy in the arts, and studio/hands-on projects. We display student artwork at individual schools as well as in the district offices, resource offices, the county fair, and public buildings in the community. Throughout the year, every school has the opportunity to participate in the monthly displays which grace the district board room. Music is an integral part of the curriculum and plays a major role in the educational program of every student. We offer a diverse and balanced array of learning experiences focused on the study of the elements common to all music rather than on the study of a small body of specific content. Our music curriculum aligns to Arizona State Standards and utilizes a diverse repertoire including folk, popular, ethnic, and electronic music forms from various cultures and historical periods. In addition to the required curriculum studies, our music department offers a wide variety of musical opportunities. We require general music for all students in Kindergarten through sixth grade, and we offer music as an elective in our middle schools. Band classes begin in the fifth grade and orchestra begins in the fourth grade. We offer special classes at selected sites including choir, recorder, piano lab, guitar, Suzuki violin, Orff Ensemble, and musical theater.